Uncompromising shine and protection in a compact size. The Wolfgang Füzion Estate Wax Mini Connoisseur’s Kit includes our finest carnauba-polymer wax with a complete set of products to prep your vehicle for a breathtaking shine. Any connoisseur of exceptional car care products deserves the Wolfgang Füzion Estate Wax Mini Connoisseur’s Kit. Wolfgang Füzion Estate Wax Mini Connoisseur’s Kit includes a complete clean-polish-protect routine. Start with Wolfgang Auto Bathe to slather your vehicle in rich suds. Then polish and conceal minor imperfections to improve the paint luster with Wolfgang Paintwork Polish Enhancer. Next apply Wolfgang Fuzion Estate Wax for the ultimate gloss and protection. In between details, use Wolfgang Deep Gloss Spritz Sealant to boost the existing wax and reignite its shine any time, anywhere. Wolfgang’s prewax cleanser removes old waxes and sealants, light oxidation, and paint contamination to reveal deep color and gloss. Once you apply a wax or paint sealant, it will enhance the smooth, clean paint created by Wolfgang Paintwork Polish Enhancer. Wolfgang Paintwork Polish Enhancer is a moisturizing cleansing lotion that uncovers the shimmering gloss of like-new paint by removing dull layers of old wax and surface impurities. Micro-fine fillers settle into light swirls and scratches to create a smooth, shiny surface in preparation for wax. Foam wax applicators are best used to apply wax quickly and evenly. The pads are soft and absorbent in order to prevent streaking and smudges. Read about Wolfgang’s origins and each product’s unique qualities in this full color handbook. 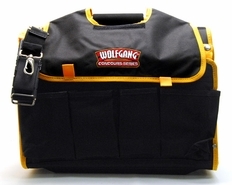 The Wolfgang Füzion Estate Wax Mini Connoisseur’s Kit brings world class car care home. This kit adds another step onto the paint care process… Clean, polish, protect and admire.